Students, independent citizens, collectives, activists, civil society organizations, teachers and members of the Zapatista National Liberation Army (‎EZLN, its initials in Spanish) participated since early this morning in demonstrations of support for relatives of the 43 students of the Isidro Burgos Rural Teachers College, in Ayotzinapa Guerrero, who complete one year today since they were disappeared after authorities detained them. 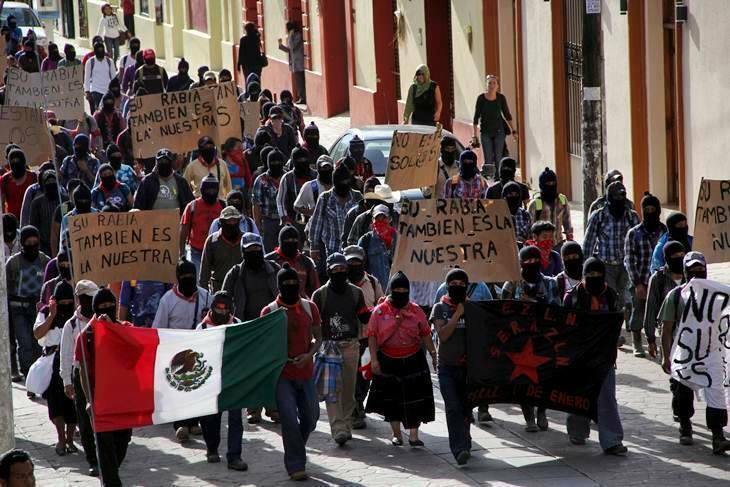 The Zapatistas carried out solidarity actions in the headquarters of their good government juntas, which exist in 5 Chiapas regions. On stages in front of thousands of the rebel group’s members, they placed 43 chairs with the names of the disappeared students, as part of silent ceremonies where they named each one of the absent youths, while the crowd shouted “present!” They also lit offerings of 43 candles and flower offerings on the side of the roads by their communities. 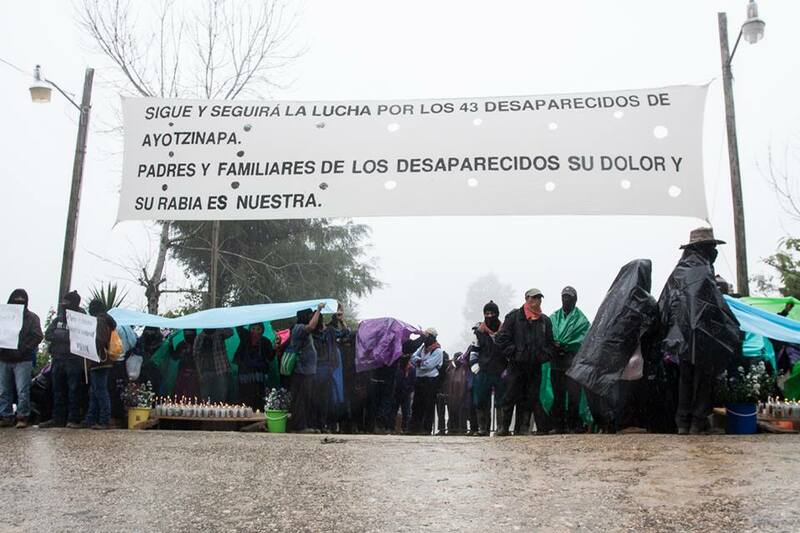 In a prior comunicado announced on the eve of the demonstrations, the EZLN also expressed solidarity with the family members and with thousands of other persons who have disappeared in the country. They questioned the authorities and said that sooner or later those guilty of the disappearances and homicides will pay for their crimes. They also demonstrated with marches and roadblocks in at least 40 Chiapas municipalities. In each one of them they ask for a transparent and independent investigation of the facts, locating the young men and for punishing those responsible. The protest actions continue and it is expected that other cultural activities and forums will be held later in support of the parents of the Ayotzinapa students. All the demonstrations have been peaceful. 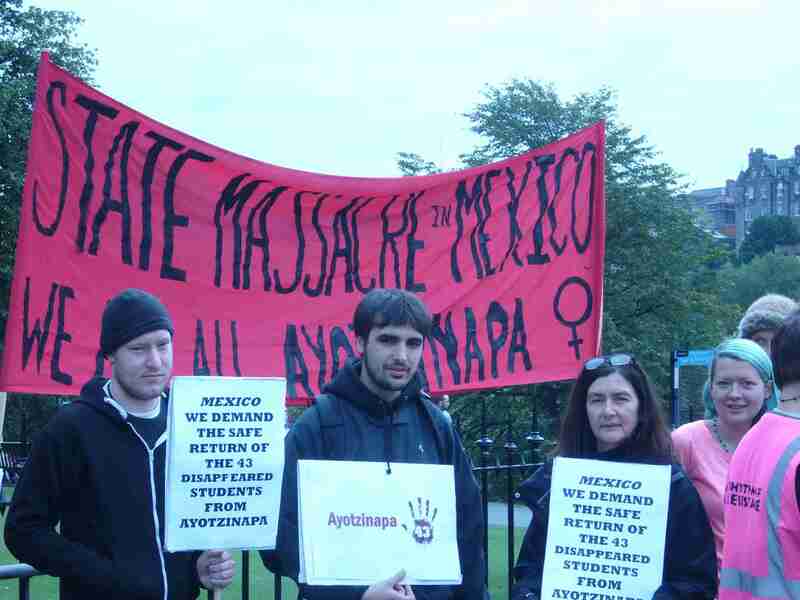 On Friday 25th September around 60 people crammed into the Autonomous Centre of Edinburgh to watch a screening of the documentary: ‘Ayotzinapa: Chronicle of a State Crime.’ Another 30 people couldn’t get in, so a second screening has been arranged for Friday. 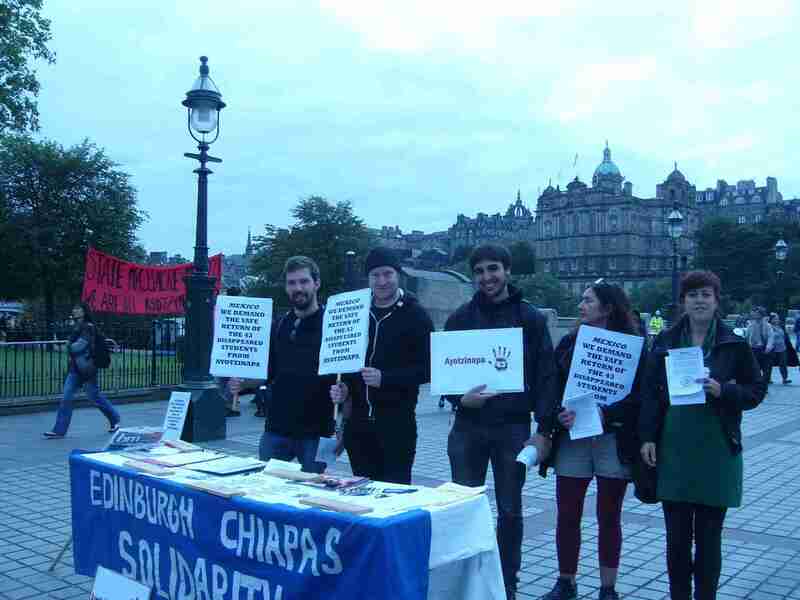 On the 26th around 30 people participated in a demo/ gathering in Edinburgh city centre, demanding the safe return of the 43 students disappeared from Ayotzinapa, with banners, placards, a stall and a petition. They distributed around 400 leaflets. Migrant women from El Barrio, New York participate in the International Tribunal of Conscience. On September 26, 2015, the women of Movement for Justice in El Barrio joined the people who are fighting for justice all over the world and gave testimony in an international platform on the struggle of migrant women against the dispossession which leads to forced migration, and against the vicious displacement from housing in order to rezone the cities between the rich and the poor. 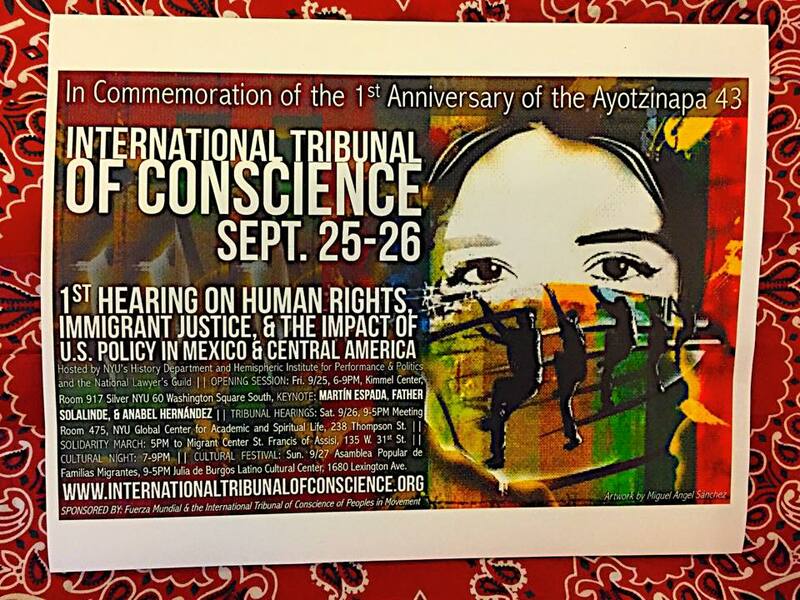 They spoke before the International Tribunal of Conscience of Peoples in Movement. On the anniversary of the disappearance of the 43 students of Ayotzinapa, and to honour them, they shared their case with other organizations that fight for justice and human rights, such as the families of the 43 missing Ayotzinapa students, and Las Abejas of Acteal, among many others. This Tribunal was composed of academics, intellectuals and human rights specialists, such as Noam Chomsky, Greg Grandin, Katrina Encompass, Boaventura Sousa Santos, Laura Carlsen, former special UN rapporteurs Rodolfo Stavenhagen and Jorge Bustamante, among others, and of organizations such as the National Lawyers’ Guild and Fuerza Mundial, among others. At the end of the trial of the court that lasted all weekend, a verdict was ruled by the jurors – unionists, judges, intellectuals, social activists, lawyers and defenders of human rights – from the United States, Mexico, other Latin American countries, Europe and Asia, who hold responsible the governments and institutions as far as they deserve for the widely propagated abuses of human rights. In more than a year in prison, Luna learned “the other face of civilization.” This is the face with which they have tried “to deceive us in the name of progress and development,” but which keeps innocents and young people in prison without opportunities. “What I lived through in the Cereso for all this time leaves me marked forever. I saw how young people between 20 and 25 years old survived, fought, and tried to overcome their limitations inside an adverse society,” he pointed out in a telephone interview. Thus, they have to maintain themselves “alert and united.” The country, he said, “is in convulsions, but there are various fronts armed for the fight” in the face of the exhaustion of the existing political and economic system. He affirmed that if the government was trying to put down the tribe’s fight against the Independence Aqueduct by imprisoning him, it didn’t work, since the indigenous authorities and the rest of the pueblo continue to defend their water and to demand the territorial integrity of their community. He followed the news from prison and when he had the chance, he held meetings with tribal authorities. Through them he learned that the Independence Aqueduct continued in operation, the work pushed forward by the PAN government of Guillermo Padres Elías—who is ten days from leaving office—to seize the water of the Yaqui River for themselves and deliver it to the businesses of Hermosillo [Sonora state capital]. Behind bars, Luna dedicated his time to the attention of young people in the detoxification centre which is operated inside the prison. He counselled, supported, and accompanied the prisoners. From the time he entered prison the prisoners and even the attendants welcomed him. They learned through the media that he was an indigenous person who defended water rights and who didn’t have to be there. They lent him clothes and a coat, and they respected him until the end. Today, he insisted, they are all part of his life, together with the community into which he was immediately reintegrated. San Cristobal de Las Casas, Chiapas. 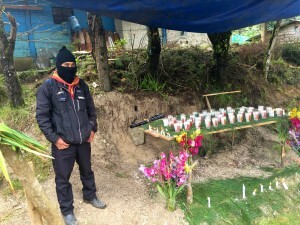 Members of the Zapatista Army of National Liberation (EZLN) demonstrated today at the Caracol, located in the community of Oventic, municipality of San Andres, to protest the disappearance of the 43 students from the Rural Normal School of Ayotzinapa. According to various testimonies, the event was held from 7am with the placing banners and altars with flowers and candles on the road that runs beside the caracol to remember the normal school students. 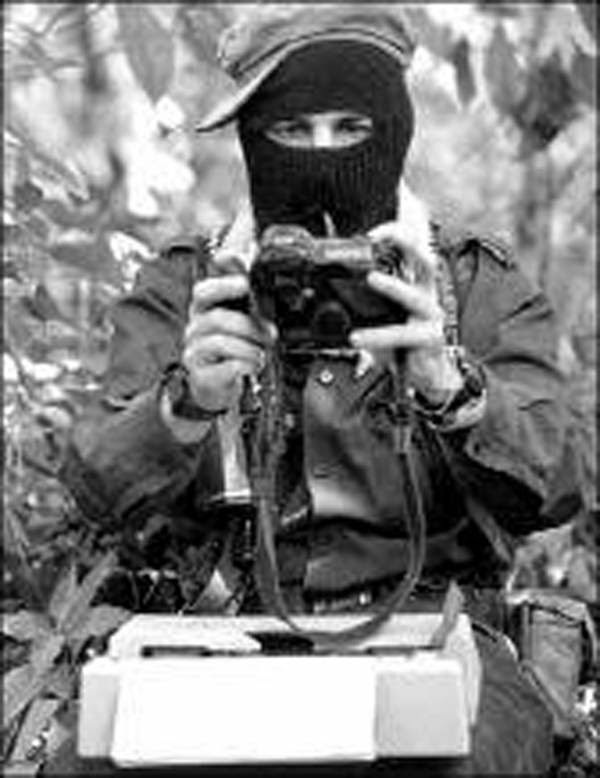 He several hundred Zapatistas from the highlands of Chiapas who participated in the act carried photographs of the 43 normalistas, disappeared a year ago. 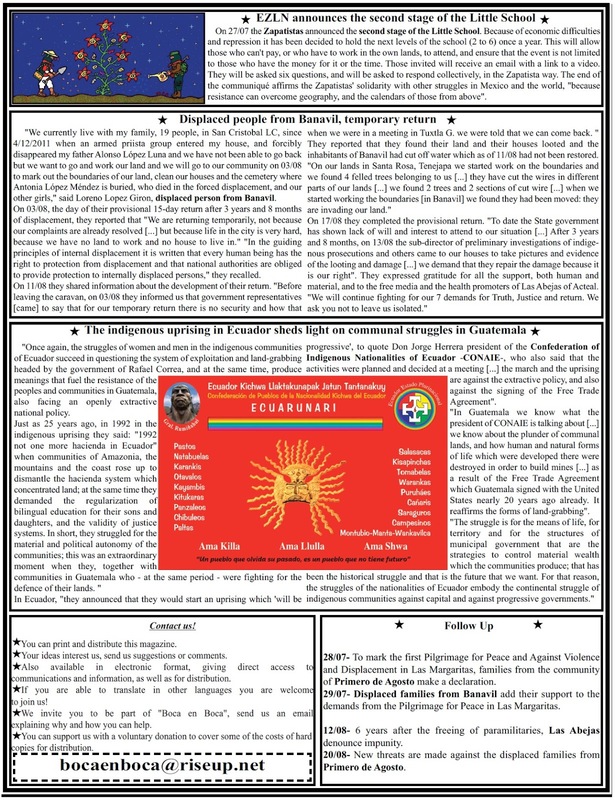 We request your support in disseminating our communiqué. We also inform you that a committee of our compañeros is participating in the megamarch in Mexico City to demand the presentation alive of the 43 disappeared by the narco-government. Hereby, the Sixth of Bachajón thanks organizations and media for joining the struggle and demanding justice for the disappearance of the 43 students from Ayotzinapa; our community wakes up and listens to the historical truth that the government has denied, we continue fighting in memory of the 43 compañeros forcibly disappeared by the narco-government. We remember that on the 26th and 27th September 2014, the 43 students from the rural normal school “Raúl Isidro Burgos” in Ayotzinapa, Guerrero, were victims of forced disappearance at the hands of the municipal narco-police, with the participation of the state and federal police and the army. One year since the disappearance and we want to say that the mothers and fathers of the 43 normal school student compañeros are not alone, their pain is our pain and we are with them in their demands for justice. We declare all our contempt and anger at the narco-government for all the suffering and pain which they have generated for the families of the 43 disappeared compañeros and the whole world. For the first anniversary, united together we will build a new path and we need to continue adding to our struggle to build a new world and spaces of freedom. Justice for the compañeros and compañeras killed for defending freedom, peace and life. 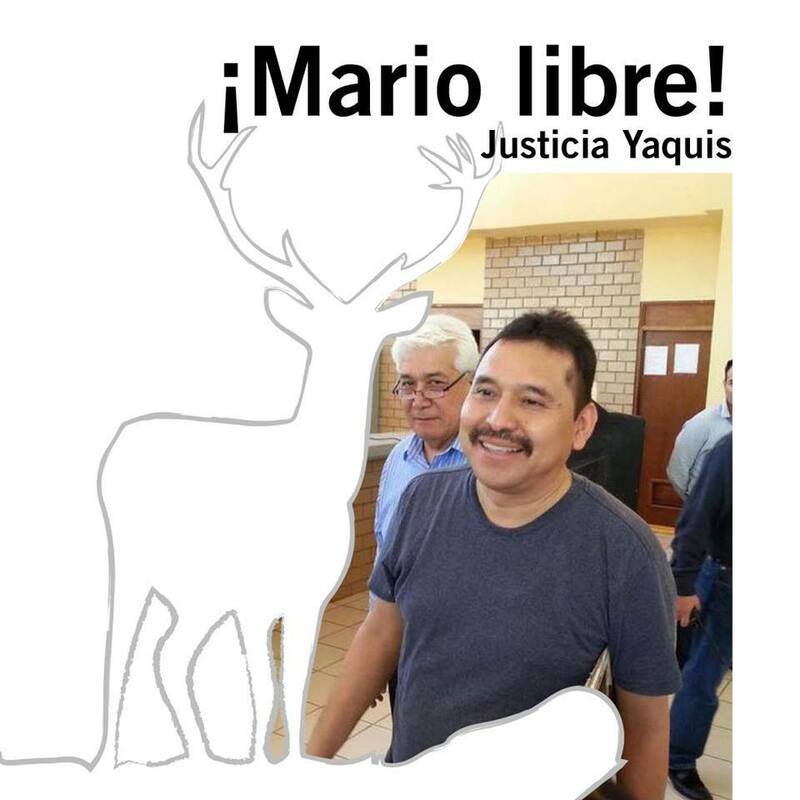 Freedom for the political prisoners of Mexico and the world. From the northern zone of the state of Chiapas, Mexico we send you a hug and a combative greeting from the men and women of San Sebastián Bachajón. The Mexican authorities’ reckless handling of the investigation into the enforced disappearance of 43 students from the Ayotzinapa teaching school in Iguala, Guerrero a year ago, exposes a scandalous cover-up orchestrated by the highest levels of government, said Amnesty International. “The Ayotzinapa tragedy is one of the worst human rights tragedies in Mexico’s recent history. It has exposed how anyone can be forcibly disappeared into thin air in the country with those in power focused on covering up the traces. Unless President Peña Nieto takes real action now he will continue to be seen around the world as an enabler of horrors,” said Erika Guevara-Rosas, Americas Director at Amnesty International. The whereabouts of 42 of the students arrested on 26 September 2014 is still unknown. The 43 students from the Raúl Isidro Burgos Rural Teacher Training College (Escuela Normal Rural Raúl Isidro Burgos, widely known simply as “Escuela Rural de Ayotzinapa”) were forcibly disappeared after they were arrested by municipal police while travelling to a demonstration in Mexico City on the night of 26 September 2014. Since then, the remains of one of the students, 19-year-old Alexander Mora Venancio, has been identified, allegedly from remains found in a trash bag in a local river. 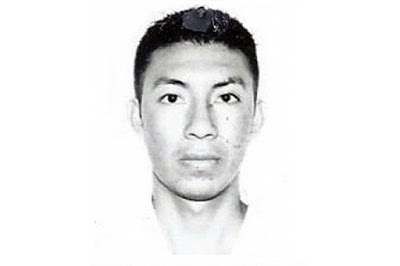 Authorities have recently claimed that a bone that belongs to 20-year-old Jhosivani Guerrero de la Cruz, another Ayotzinapa student, was found in the same bag. However, experts from the Argentine Forensic Anthropology Team said that the very specific DNA test run on the remains was inconclusive. The Interdisciplinary Group of Independent Experts (GIEI) appointed by the Inter-American Commission on Human Rights have also refuted the Mexican government’s official account of events. In a report made public on 6 September, they said it was scientifically impossible for that number of bodies to have been burned in a dumpster in the conditions claimed by the authorities. Other deep failures in the official investigation into the student’s enforced disappearance include the reckless handling of key forensic evidence, some of which was never processed at all. Officials who first arrived in Iguala the night the students were arrested did not take pictures, collect blood, hair, clothes or fingerprints. Whole areas of the crime scene were not processed at all. Mexican authorities have also barred the independent experts from interviewing soldiers of the 27th infantry battalion, based in the town where the students were arrested. Declassified intelligence documents have since revealed that military officers in Iguala knew about the illegal detentions and the abuses against the students. “If the government is convinced the military do not have any relevant information to provide, what are they so worried about? Concealing local soldiers from the investigations raises alarming questions,” said Erika Guevara-Rosas. Since the students were detained and forcibly disappeared, more than 100 people were arrested in relation to the disappearances (roughly 50% police officers and 50% alleged members of criminal gangs). Some of them have claimed they were tortured into confessing to abducting the students. “The lack of transparency and the way the students’ relatives are being treated is astonishing, even by the standards of a country that seems utterly incapable of tackling human rights abuses,” said Erika Guevara-Rosas. 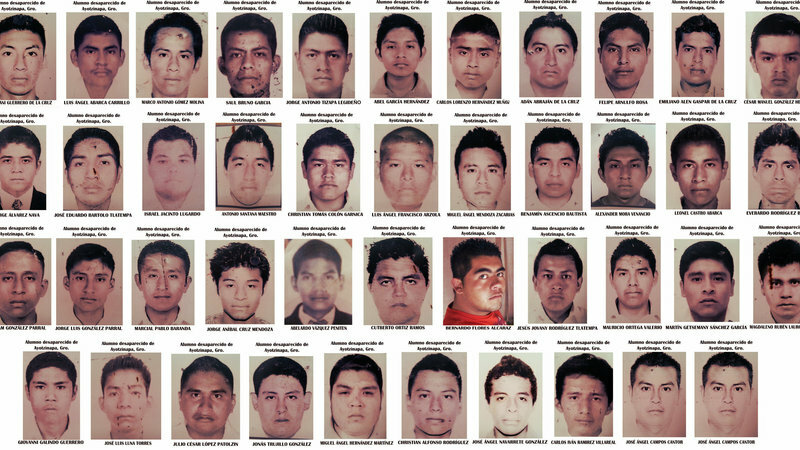 “Mexican authorities must stop playing games with the relatives of the Ayotzinapa students. They must urgently redirect investigations and, amongst other measures, allow independent experts access to all crematories in and near Iguala,” said Erika Guevara-Rosas. Since the enforced disappearance of the students, at least 70 mass graves containing the remains of dozens of people were uncovered. Most of those bodies have not been identified yet. 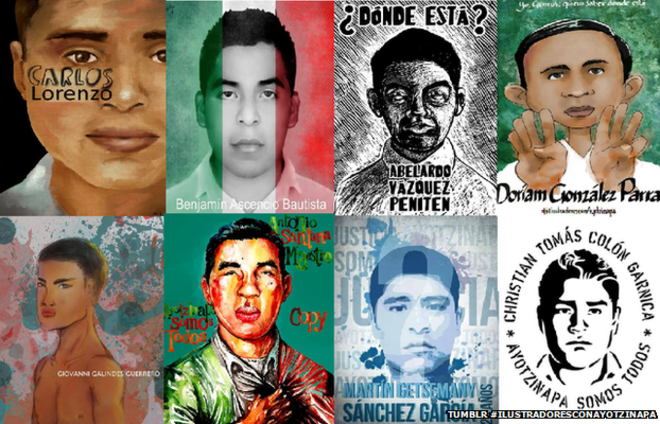 The disappearance of the students happened in the context of a national human rights crisis with more than 26,500 people disappeared or missing in Mexico in the past years, almost half of them during the current administration of President Peña Nieto. 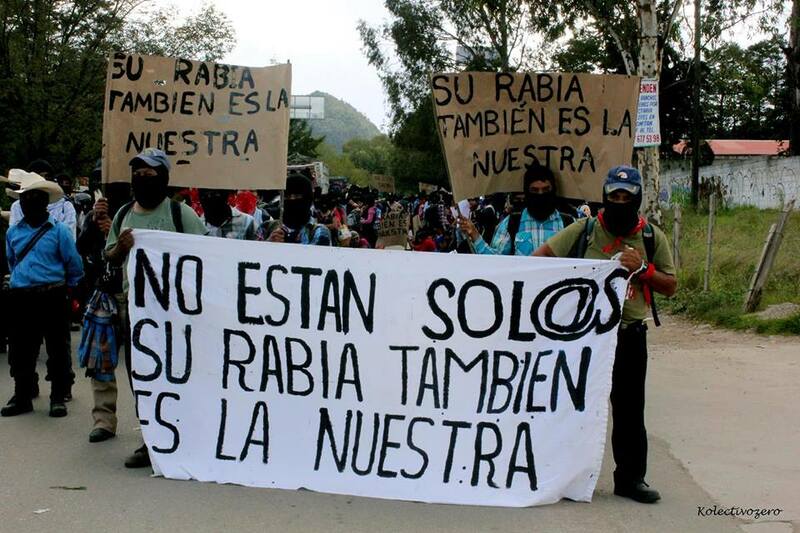 “In Resistance and Rebellion we demand Justice”: EZLN to Ayotzinapa, 26th September 2015. Oventic, Chiapas, 26 September, 2015. 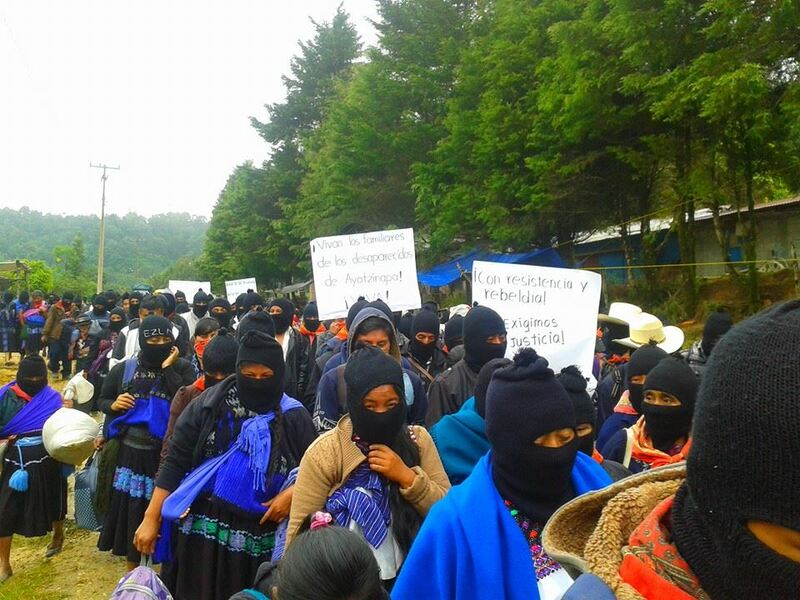 Thousands of support bases of the Zapatista Army of National Liberation (BAEZLN) rallied from an early hour in their different territories in Chiapas in solidarity with the families and compañeros of the 43 disappeared students from the rural normal school of Ayotzinapa in Iguala, Guerrero. As they had announced since 24th September, children, women, men and elders from the Highland zone demonstrated along the road opposite the caracol of Oventic “Central Heart of the Zapatistas before the world” with banners, posters, candles, bearing the names of each of the 43 missing from the normal school of Ayotzinapa. Under a constant drizzle, the demonstration was held in the context of protests nationally and internationally to demand the live presentation of the rural normal school students, missing for a year. 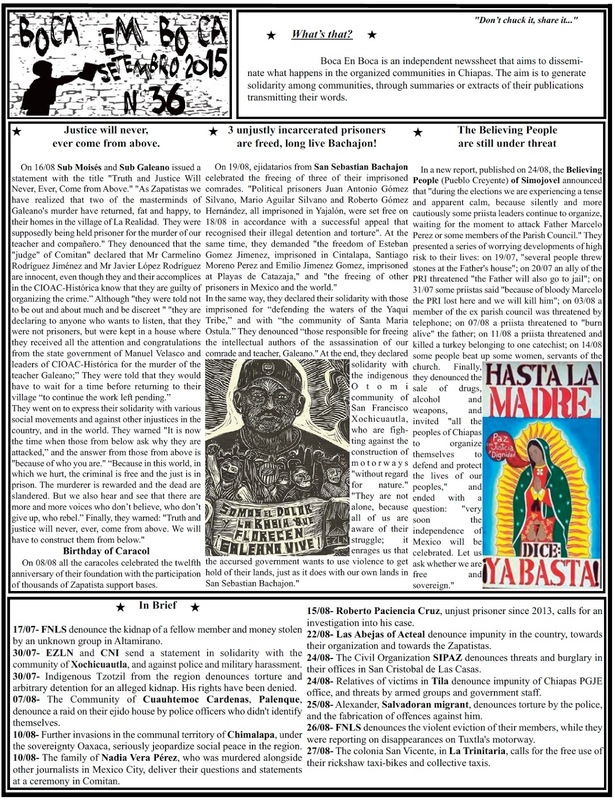 Zapatistas from Oventik with Ayotzinapa: 26th September 2015. 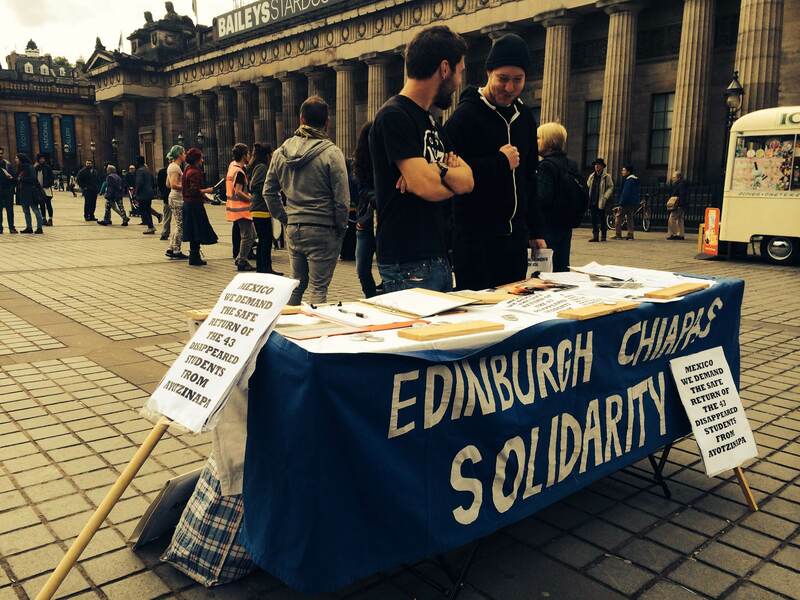 London Mexico Solidarity: One Year After We Are Still Fighting. On September 26th 2014 students from the teacher-training college of Ayotzinapa, in Guerrero, Mexico, were attacked by police forces whilst being monitored by intelligence agencies of the Mexican army and the federal police. Three students and three bystanders were killed, 40 students were injured and 43 disappeared by the police. 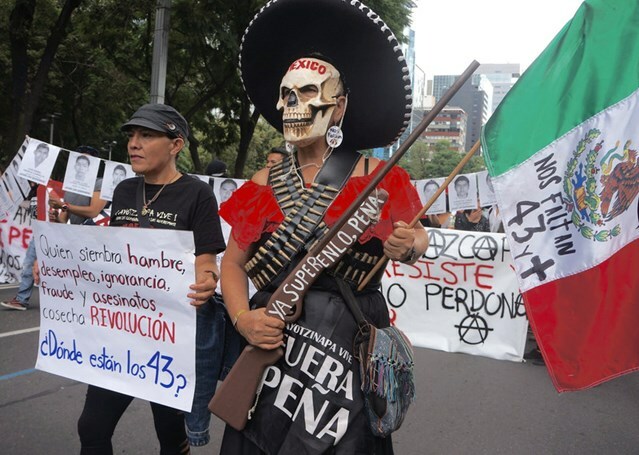 In early September 2015, almost one year later, an international group of independent experts of the Inter-American Commission on Human Rights rejected the investigation of the Mexican government into the attack and disappearance of the students, confirming that the 43 students are still disappeared and that the official investigation has to be refocused to include the participation of State agents in the attack and their active role preventing the search for the truth, as a central element. One year after we still demand the return of the 43 students alive, truth and justice, as well as punishment for those responsible for the attack and for the failures in the investigation. Come along to our activities and help us spread the voice of the 43, their relatives and the victims of disappearance in Mexico, which on the last count are around 30 000 people in the last ten years in the context of the so-called “war on drugs”. 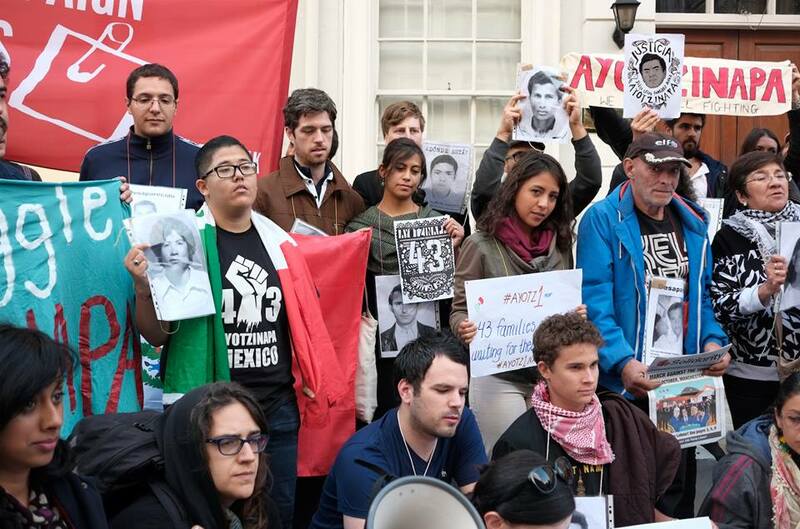 This September 26 2015, one year after the attack, around 150 people gathered to claim for justice outside the Mexican embassy to the UK. Representatives from different campaigns and people in solidarity expressed their concerns regarding Mexico’s human rights crisis and the role the of international community. Thanks to National Campaign Against Fees and Cuts Marxist Student Federation National Union of Teachers Campaign Against Arms TradeAmnesty International London Palestine Action @Spanish and Latin American Poets and Writers London, London-Chile Solidarity, Movimiento Micaela Bastidas-UK Yosoy132Londres and JusticeMexicoNow for your support! 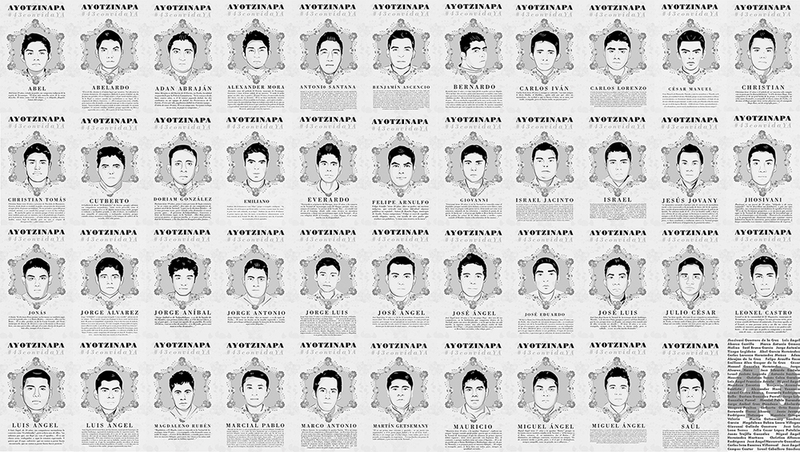 Words and Silence: One year after the forceful disappearance of the 43 students from Ayotzinapa, Mexico. 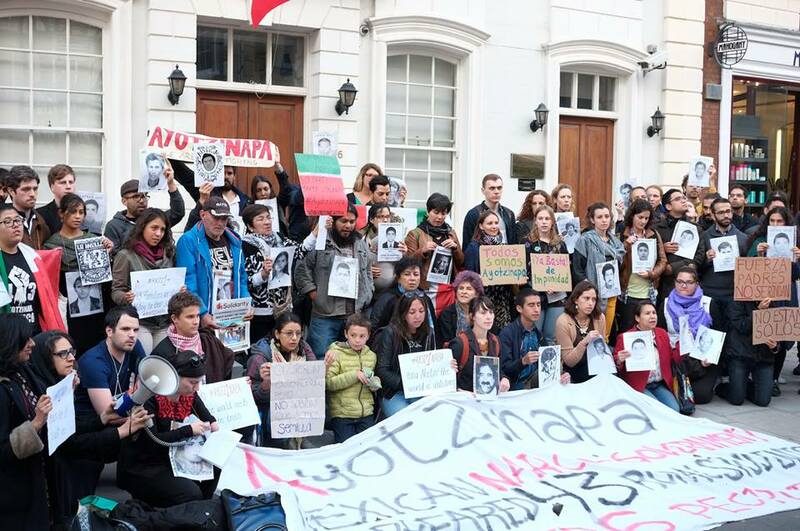 Demonstration in London before the Mexican Embassy. September 26, 2015. Our collective heart knows, now as before, that our pain is not a sterile sorrow. It knows that our rage is not some useless venting. We, who are what we are, know that our pain and rage are birthed and nourished by lies and injustices. Because for those who are above at the cost of those of us below, lying is a way of doing politics and they adorn death, forced disappearance, imprisonment, persecution, and murder with the scandal of their corruption. Those above, whatever the colour of their politics, are shameless criminals with impunity. It doesn’t matter if they try to hide behind a change of name and flag; it is always the same face, the same pride, the same ambition, and the same stupidity. It is as if in their acts of killing and disappearing people they want to kill and disappear memory as well. From above and from those who make their nests of vileness and perversion there, we will only get lies as salaries and injustice as pay. And like clockwork, lies and injustice arrive every day, every hour, everywhere. They are not satisfied with dispossessing us of our work, life, land, and nature. They also rob us of our sons, daughters, sisters, brothers, fathers, mothers, relatives, compas, friends. Those above persecute. Imprison. Kidnap. Disappear. Murder. They not only destroy bodies and lives. They also destroy histories. And on that erased memory they build impunity. Oblivion is the judge that not only absolves, but also rewards. This is why our pain and rage search for truth and justice. Sooner or later we learn that these cannot be found anywhere, not in a book, a speech, a juridical system, an institution, a promise, a time or a place. We learn that we have to build them. It is as if the world is not yet complete, as if there were a hole, a wound in its belly, its heart lacerated by the colour of the Earth that we are. That is how we learn that without truth and justice there is no day or night that is complete. No calendar can settle, no geography can rest. In many tongues, languages, and gestures, we name those who are not among us. And every pain and rage takes on a name, a face, a history, a void that hurts and infuriates. The world and its history are thus filled with absences, absences that murmur, speak, yell, cry out. We do not scream out of grief. We do not cry out of sorrow. We do not murmur in resignation. Our voice is so that those who are absent find the path of return. So that they know that they are here even though they are absent. So that they do not forget that they are not forgotten. 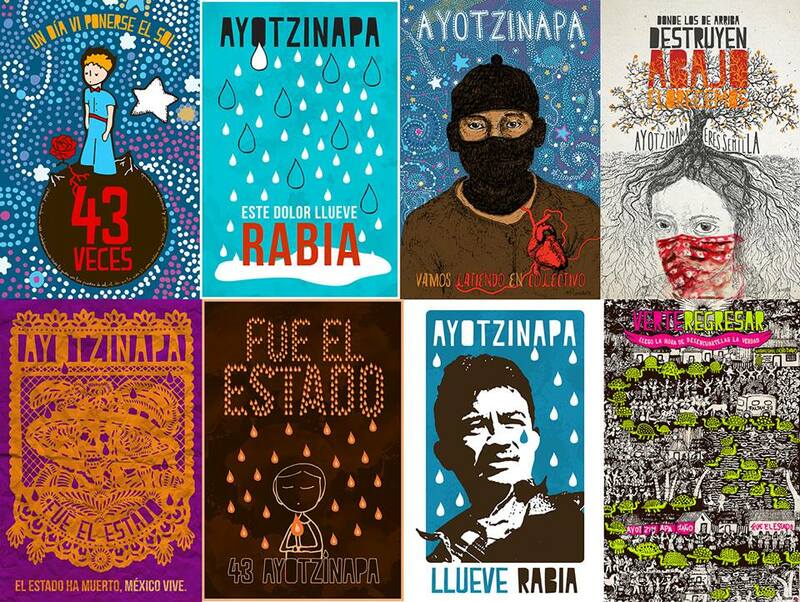 Because of this: from pain, from rage, for truth, for justice, for Ayotzinapa and for all of the Ayotzinapas that wound the calendars and geographies from below. This is why we rebel. Because the time will come when those who owe us everything will have to pay. Those who will pay are those who were responsible for the persecution, imprisonment, beatings, and torture. Those who imposed the desperation of forced disappearance will pay. Those who murdered will pay. The system that created, fed, covered, and protected the crimes disguised as bad government will be destroyed. Not prettied up, not reformed, not modernized. Rather, demolished, destroyed, finished, buried. That is why at this time our message is not one of consolation or resignation for those who are hurting because of one or many absences in their lives. Our message is of rage and fury. Because we know that same pain. Because we have within us the same rage. Because, being different, we are alike. That is why we resist; that is why we rebel. Because of pain and rage. And that is why: do not give up. Do not give in. Do not sell out. This September 26, thousands of Zapatista children, young people, women, men, otroas,[i] elders, alive and dead, will mobilize in our territories in order to embrace those people who feel pain and rage because of imprisonment, disappearance, and death imposed from above. We embrace them in this way because that is how we Zapatistas embrace each other. Thus we call upon all those honest persons on the planet to do the same, in their calendars and geographies, according to their ways and times. Because as long as they try to make lies and mockery stand in for the lack of truth and justice, humanity will continue to be a grotesque grimace on the face of the Earth. Felipe Arnulfo Rosa, Jorge Aníbal Cruz Mendoza, Magdaleno Rubén Lauro, José Luis Luna Torres, Mauricio Ortega Valerio, Jorge Anotnio Tizapa, Antonio Santana Maestro, Marco Antonio, Cesar Manuel Gonzales, Saúl Bruno, Adán Abraham de la Cruz, Christian Tomas, Jesús Jovany Rodríguez, Luis Ángel Francisco Arsola, Alexander Mora Venancio, Julio Cesar Ramírez Nava, Jorge Alvares Nava, Magdaleno Ruben Lauro Villegas, Jose Luis Luna Torres, Jesus Jovany Rodríguez Tlatenpa, Mauricio Ortega Valerio, José Ángel Campos Cantor, José Anival Cruz Mendoza, Giovani Galinez, Joshuani Guerrero de la Cruz, Carlos Lorenzo Hernández Muñoz, Israel Jacinto, Adan Abraham De la cruz, Christian Alfonso Rodríguez, Martín Getsemany Sánchez, Cutberto Ortiz Ramos, Everardo Rodríguez Bello , Marco Antonio Gómez Molina, cesar Manuel Gonzales Hernandez, Christian Tomás Colon Garnica, Luis Ángel Francisco Arzola, Leonel Castro Abaraca, Miguel Ángel Hernández Martínez, Jonás Trujillo González, José Eduardo Baritol Tlatempa, Julio Cesar López Patolin, Carlos Ivan Ramírez, Antonio Santana Maestro. A portrait of Jhosivani Guerrero de la Cruz is painted a few meters from his house on the outside walls of the tele-middle school [distance learning] in Omeapa. Next to him are the faces of two other friends from the pueblo. They grew up and studied together. 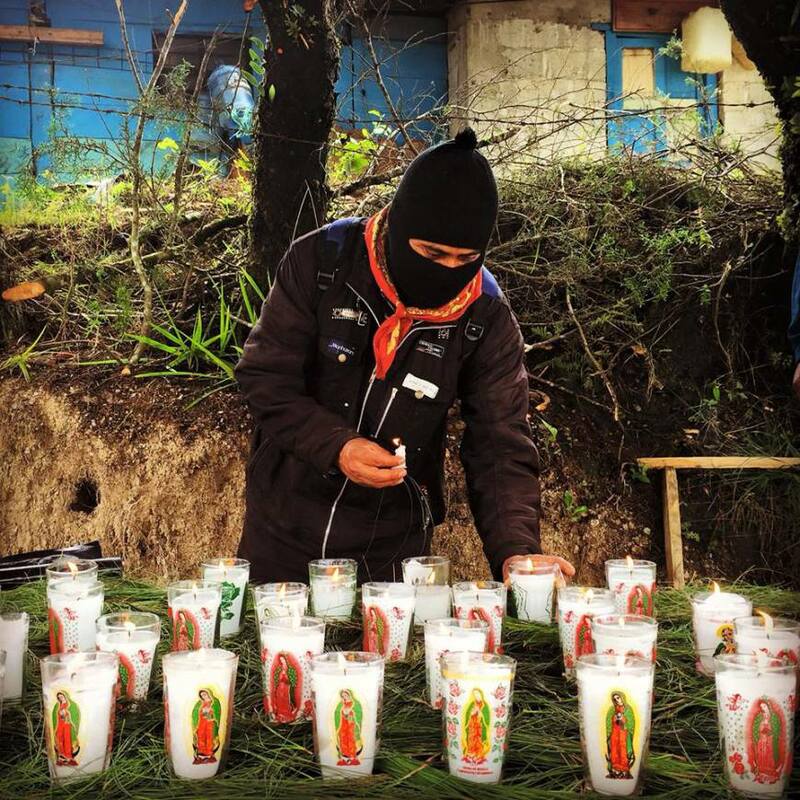 Together they entered the rural normal school of Ayotzinapa. Together they disappeared. Omeapa is about 15 minutes drive from Tixtla de Guerrero, the municipal seat. Omeapa has fewer than 400 residents, some of whom still speak an indigenous language. They live in ninety modest houses, many with dirt floors. More than forty of them over the age of 15, can neither read nor write. Jhosivani is the youngest of seven children in a family that works in farming. As a child he loved to play with cars. His relatives say that he is a potential little genius. Before entering the normal school [teachers college], he passed the time inventing all kinds of instruments. He wanted to be a chemist, but going to college was impossible. His parents keep his room just as he had it before the tragic September 26. The wires he used in his creations are still there. His parents first called him Efraín, but the name did not suit him. After several attempts, they named him Jhosivani. With a slender face, his classmates nicknamed him The Korean. When they disappeared him, he was 20 years old. He entered the teachers college to have a profession, to get ahead and help his community. On September 16, Arely Gómez, Attorney General of the Republic, declared that forensic experts from the University of Innsbruck in Austria had concluded that there is a 72-to-1 probability that a bone fragment analyzed by them belonged to someone (genetically) related to the student’s mother [rather than to any other person]. The remains were found inside a bag that, according to experts with the Argentine Forensic Anthropology Team (EAAF), was discovered without following steps established [to assure] the chain of custody. With utter lack of sensitivity, rather than first informing Jhosivani’s family members of the finding and conclusions, the Attorney General publicly announced the results. Members of the EAAF gave the Attorney General’s version an unusual reprimand by explaining that the conclusion of the analysis performed by the Innsbruck laboratory on the remains is that there are indications, but not certainties. Anayeli, Jhosivani’s sister, thinks that after so many lies the government has told them about the disappeared youths, it is difficult to say now what might be true. Anayeli, Pedro Juárez (her husband), Margarito (her father)—whom they call Don Benito—and her mother, Doña Martina, have searched tirelessly for Jhosivani. When Doña Martina finally heard the news, she did not believe the government. For the Guerrero de la Cruz family and other family members of the 43 disappeared, life changed dramatically on the night of September 26. The search for their boys became the centre of their existence. Everything changed. For them nothing is the same. Many family members have moved to the Raúl Isidro Burgos Rural Normal School. Their days and nights take place within its walls. There they sleep, eat, wash and dress themselves, inform and organize themselves, meet with supportive groups. From there they face the new challenges that lie ahead, keep abreast of what is happening, keep searching for their loved ones and set out for their committees and meetings. Not just a few have had to leave behind crops, care of animals and preparation of the land for new plantings. Others have lost their jobs. The work of maintaining properties and houses has been abandoned. The family dynamic has profoundly changed. In some families, members take turns participating in meetings and marches. Putting themselves into movement as an organized community, they honour their sons. Nothing else has mattered to them—not the distance between their houses and the school, not their health, not their economic insecurity. Searching for their sons is central to their lives. It is an urgency that permits neither pause nor rest. They dream about them, think about them, speak with them, dedicate their memories to them, feel with them. Networks of solidarity and bonds of affection able to withstand adversity and despair have been woven among the relatives of the disappeared. One year together, united by a common tragedy, has tempered them as a group and allowed them to deal with the natural diversity of their views. The family members expect nothing from the government. The authorities have deceived them. They have transmitted false expectations about their sons’ whereabouts. They have broken promise after promise. Several officials have insulted them by trying to bribe them, divide and discredit them. The official versions—distorting and misrepresenting the facts, then using the power of the media at their service to propagate [the distorted, misrepresented facts]—have generated enormous frustration and distrust. Again and again, repression has been the response to their demand for truth and justice. In many different ways, the other parents and relatives of the disappeared say the same thing. They are going to the meeting with the President demanding the safe return of their young men. Justice will never, ever come from above. 3 unjustly incarcerated prisoners are freed, long live Bachajon! 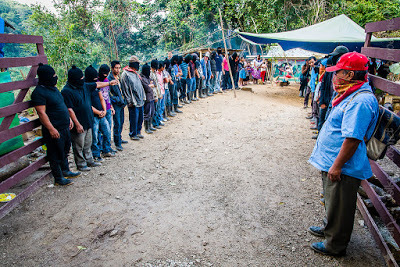 On 27/07 the Zapatistas announced the second stage of the Little School. Because of economic difficulties and repression it has been decided to hold the next levels of the school (2 to 6) once a year. This will allow those who can’t pay, or who have to work in the own lands, to attend, and ensure that the event is not limited to those who have the money for it or the time. Those invited will receive an email with a link to a video. They will be asked six questions, and will be asked to respond collectively, in the Zapatista way. The end of the communiqué affirms the Zapatistas’ solidarity with other struggles in Mexico and the world, “because resistance can overcome geography, and the calendars of those from above”. “We currently live with my family, 19 people, in San Cristobal LC, since 4/12/2011 when an armed priista group entered my house, and forcibly disappeared my father Alonso López Luna and we have not been able to go back but we want to go and work our land and we will go to our community on 03/08 to mark out the boundaries of our land, clean our houses and the cemetery where Antonia López Méndez is buried, who died in the forced displacement, and our other girls,” said Loreno Lopez Giron, displaced person from Banavil. On 03/08, the day of their provisional 15-day return after 3 years and 8 months of displacement, they reported that “We are returning temporarily, not because our complaints are already resolved […] but because life in the city is very hard, because we have no land to work and no house to live in.” “In the guiding principles of internal displacement it is written that every human being has the right to protection from displacement and that national authorities are obliged to provide protection to internally displaced persons,” they recalled. On 17/08 they completed the provisional return. “To date the State government has shown lack of will and interest to attend to our situation […] After 3 years and 8 months, on 13/08 the sub-director of preliminary investigations of indigenous prosecutions and others came to our houses to take pictures and evidence of the looting and damage […] we demand that they repair the damage because it is our right”. They expressed gratitude for all the support, both human and material, and to the free media and the health promoters of Las Abejas of Acteal. “Once again, the struggles of women and men in the indigenous communities of Ecuador succeed in questioning the system of exploitation and land-grabbing headed by the government of Rafael Correa, and at the same time, produce meanings that fuel the resistance of the peoples and communities in Guatemala, also facing an openly extractive national policy. In Ecuador, “they announced that they would start an uprising which ‘will be progressive’, to quote Don Jorge Herrera president of the Confederation of Indigenous Nationalities of Ecuador -CONAIE-, who also said that the activities were planned and decided at a meeting […] the march and the uprising are against the extractive policy, and also against the signing of the Free Trade Agreement”. “In Guatemala we know what the president of CONAIE is talking about […] we know about the plunder of communal lands, and how human and natural forms of life which were developed there were destroyed in order to build mines […] as a result of the Free Trade Agreement which Guatemala signed with the United States nearly 20 years ago already. It reaffirms the forms of land-grabbing”.